Sat, Sun & Pub. Hols. Please call us to check if we are open on public holidays. Please call our friendly staff to book your appointment. 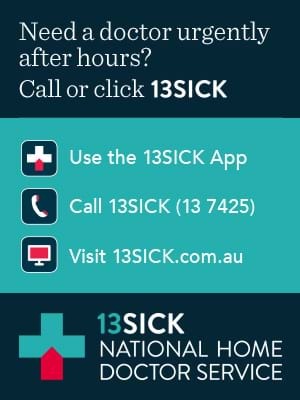 For out of hours care, please call 13SICK (13 7425). We value your feedback and complaints. Please call your Medical Centre where our staff and Practice Manager are available to hear your feedback. Our team will then manage the process to ensure your complaint is treated and responded fairly as per our company policy and procedures.